Home opinion WILL CYRIL RAMAPHOSA BE SOUTH AFRICA’S FUTURE RENEWAL MAN? WILL CYRIL RAMAPHOSA BE SOUTH AFRICA’S FUTURE RENEWAL MAN? Ramaphosa – the current deputy president. If the astute businessman and former revolutionary trade unionist manages to break speed limits and at the same time avoid serious political accidents, he may well write his name into the pantheons of South Africa’s undisputed political heavyweight champions. From Johannesburg, Pusch Commey finds out why. Like the British Constitution, it is an unwritten rule that the elected deputy president of the party becomes the deputy President of the State, who automatically ascends to the throne of ultimate power in South Africa. That man now is Cyril Ramaphosa. The Multi-millionaire business magnate and politician is largely credited for his role in steering South Africa from the abyss of a racial conflagration 20 years ago to the admirably functioning democracy that it is today. After a failed bid to succeed Nelson Mandela he disappeared in 1997 into the political wilderness. In this wilderness he made for himself a million dollars fortune through his business savvy and political connectivity. He is rated 61 in Africa according to Forbes Magazine’s rich list. Now he is back from the political cold to perhaps rescue a country and a party in dire need of new ideas. Africa’s oldest liberation movement, the African National Congress ( ANC) has been 82 years in the trenches, and 20 years in government (102 years). It has been trying hard with varying degrees of success to fix the political, social and economic damage inflicted by apartheid. Now, after a reduced majority in the last elections in May this year (2014), there is consensus that the Party needs renewal, and a strong hand to address the socio-economic transformation of a reeling economy. The pace of socio-economic change after twenty years in power has become the big issue for its electoral base. Poverty, unemployment and inequality are the three evils plaguing the country and its future. Ramaphosa was elected the Deputy President of the party last year. In May this year President Zuma appointed him the Deputy President of the Country and heir apparent to the Presidency. His second coming is generating much interest. Years ago no one would have lost sleep if he had become the President of the country. As fate would have it, he lost the battle to become Nelson Mandela’s Deputy in the ANC and in government 20 years ago. Instead he was elected General Secretary of the party, with Jacob Zuma as his deputy. It is reported that Zuma who felt he was more deserving regarded the election of Ramaphosa as a mistake. Now that is history. Thabo Mbeki inched past Ramaphosa for the coveted position of Deputy President. None would have predicted the subsequent twists and turns that has brought the country where it is today. And there may yet be more to come. Cyril Ramaphosa, was a key figure in South Africa’s historical narrative towards democracy. Having formed the powerful National Union of Mineworkers (NUM) which led to the formation of the Congress of South African Trade Unions ( COSATU) in 1985, the Lawyer/Politician significantly altered the course of the apartheid debate. Leveraging black labour power he escalated internal pressure when he joined forces with various umbrella bodies that led to the epochal mass movement the United Democratic Front (UDF). Apartheid reeled as rolling mass action, strikes and demonstrations made the country ungovernable sending it into an economic tailspin. UDF’s actions, coupled with several other events like the battle of Cuito Cuanavale in Angola, international and African pressure, the fall of the Soviet Union, and the pressure by international banks and capital, brought apartheid regime to its knees and the negotiating table. This led to the inevitable release of Nelson Mandela and the unbanning of all liberation movements. And when good negotiating skills were sorely needed Cyril was the man. He was widely regarded as a formidable negotiator and strategist, having cut his teeth in the labour movement, negotiating with tough mine bosses. In partnership with the National Party’s Roelf Meyer, the country’s first democratic elections on April 1994 became a reality. Ramaphosa has been made Leader of Government Business in the National Assembly. His responsibilities will include: The affairs of the national executive in Parliament; the programming of parliamentary business initiated by the national executive, within the time allocated for that purpose, and ensuring that Cabinet members attend to their parliamentary responsibilities. As a businessman in the Private sector he was the executive chairman of Shanduka Group, a company he founded. Shanduka Group has investments in the Resources Sector, Energy Sector, Real Estate, Banking, Insurance, and Telecoms. He was also chairman of The Bidvest Group Limited, and MTN. His other non-executive directorships included Macsteel Holdings, Alexander Forbes and Standard Bank. In March 2007 he was appointed Non-Executive joint Chairman of Mondi, a leading international paper and packaging group, when the company demerged from Anglo American plc. In July 2013 he retired from the board of SAB Miller plc. He has garnered several honorary doctorates and international accolades. He was included in the Time magazine annual list of 100 men and women whose power, talent or moral example is transforming the world. He has now parked his money, giving up several of his business interests to focus on politics, a sign that he is positioning to lead South Africa. But will he be able to deliver economic freedom to the hapless masses as he has done for himself and for politics? Ramaphosa’s street credibility took a serious dent with the advent of a deadly strike in the Platinum belt of North Western South Africa. It may come back to haunt him. The Marikana Massacre as it came to be known, occurred when police broke up an occupation by striking Lonmin mine company workers of a ‘koppie’ (hilltop) near Nkaneng shack settlement in Marikana on Thursday, 16 August 2012. As a result of the police shootings, 34 miners died and an additional 78 miners were injured causing anger and outcry against the police and the South African government. Further controversy emerged after it was discovered that most of the victims were shot in the back and many victims had been shot far from police lines. The violence on 16 August 2012 was the single most lethal use of force by South African security forces against civilians since the end of apartheid. 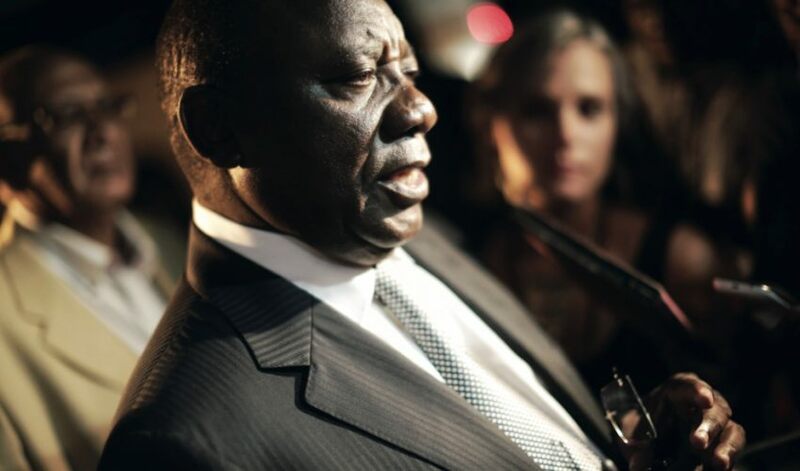 During the Marikana Commission of enquiry set up by the government, it also emerged that Lonmin management solicited Lonmin shareholder and ANC heavyweight, Cyril Ramaphosa, to coordinate “concomitant action” against “criminal” protesters. Whether he in fact did so or not is in dispute. Much has also been made of the fact that he was reported to have paid a million pounds ( 18 million rand) for a bull at an auction, while the poor mineworkers whom he once represented, and who were striking for a living wage were mowed down over a pittance. Cyril Ramaphosa, has however always maintained that, while not being a member of the South African communist party, he was a committed socialist. South Africa has indeed woken up to some harsh economic realities. When it was knocked off the perch as Africa’s biggest economy by Nigeria this year, many South Africans who had long gloried in being Africa’s economic superpower were shell shocked. Wage sector strikes have become the order of the day. Service delivery protests have become a proverb. This year, the economy actually shrunk to 0.6 % in the first quarter, leading to fears of a recession. The gini co-efficient stands at 0.7 making it one of the most unequal countries in the world. There is an official unemployment rate of 25%. The unemployment rate among youth ( aged 15 – 34) has increased from 32.7% to 36.1 % between 2008 and 2014 according to the latest Statistics SA report on national and provincial labour market trends among the youth. Young adults make up between 52-64% of the labour force in South Africa. Besides, 33% of the populace live on government handouts, and black South Africans constitute 90% of the unemployed. The serious structural defect in the erstwhile racially designed economy has not been sufficiently addressed. Racial tensions and social instability rears its head in the fact that ownership of the economy is overwhelmingly white, leaving room for the contestation for political power of parties like the Economic Freedom Fighters (EFF). Led by the enfant terrible of South African politics, Julius Malema, the barely 8 month old party managed to secure a respectable over a million votes out of 17 million, and 25 seats in parliament out of 400. This relative EFF success many belive, is because Its economic message resonated with the masses. Inequality drawn along racial lines continues to be a pivot of unhappiness amongst the triple evils of poverty, inequality and unemployment. With respect to household income the average for whites is 365 000 rand ( $ 42 000 per annum), Indians 251 000 rand , mixed race 251,500 and Blacks 60 600 rand. 79% of the land is still effectively in the hands of about 10% of the white population. All are relics of colonialism and apartheid. How to grow the economy, transform the ownership structure and get able bodied people to contribute has been a huge headache. Now the panacea, following on the heels of previous plans, is the National Development Plan. Essentially the NDP recognises nine primary challenges the government has to overcome by 2030: Too few people are employed, many black people are poorly educated, infrastructure under development especially in poorer areas remains high, diversifiying of the economy from dependence on natural resources, dealing with a poor public health system and public services, a bringing together adivided society that lacks cohesion, and high levels of corruption. Underpinning the NDP, is a war on poverty and the need for education and skills are seen as vital. The lack of these lead to unemployment and which leads to poverty and inequality. The plan is to grow the economy such that employment increases with growth. Education and skills take a prominent place. Entrepreneurship is also emphasized. The aim, among others, is to eliminate poverty and create 11 million jobs by the year 2030. “By 2030 we must be able to declare that no South African lives below a poverty line and we can fix that line,” Trevor Manuel, the then Minister in the Presidency for the National Planning Commission, said in the introduction in 2011. President Jacob Zuma appointed the National Planning Commission in May 2010 to draft the NDP. An advisory body consisting of 26 people, the commission was drawn largely from outside the government, with members being selected for their expertise in key areas. It was chaired by Manuel, with Cyril Ramaphosa as Deputy Chairman. Ramaphosa was a chief architect behind the National Development Plan. And he will be driving it to 2030. Is it a good plan? For a start, the trade unions he helped form when in Cosatu are strongly opposed to the NDP, complaining that the structural defect of a house cannot be rectified by extensions, plastering and painting. It has to be torn down and rebuilt or properly refurbished by first getting rid of those historical defects. The white led official opposition The Democratic Alliance likes the plan however. Malema’s EFF will not sign on. The party belives the problem is the stranglehold of white monopoly capital and its ralliying call is for the nationalisation of major sectors of the economy. Julius Malema has called it a neo -liberal right wing and reactionary policy framework that will lead to more socio-economic problems. Cosatu likens the NDP to the short lived 5 -year Growth, Employment and Redistribution( GEAR) plan adopted by the ANC after 1996 to address the very same issues. It was about privatisation, removing exchange controls and linking output to labour. It brought macro economic stability to the country but failed to solve economic inequality or bring real black empowerment. The NDP has also was largely been described as the kind of trickle- down economics that asked the dispossessed to wait for the owners of land and capital to double or triple their wealth so that crumbs can fall to the workers who produce it. Cosatu points out that though the plan supports a long term vision and an interventionists approach it will not help South Africa to escape from the growth path inherited from the days of colonialism and apartheid, nor will it create large numbers of decent sustainable jobs which are desperately needed. Cosatu’s call is for a radical economic shift , a developmental state and a plan for a new growth path. There are many contenders to the Presidency of the ANC in 2017, and Head of State in 2019. There is the Secretary General of the ANC Gwede Mantashe, who is said to have Presidential ambitions. Then there is the Ex-wife of President Zuma and Current Chairperson of the African Union, Dr Nkosazana Dlamini-Zuma. The current speaker of the National assembly Baleke Mbete is also touted as a possible candidate. And there are many wildcards. Zuma himself has openly said he would prefer a woman candidate for the Presidency. The ANC will inevitably win the election in 2019, unless something cataclysmic happens. And come that day, many south Africans are already predicting Cyril Ramaphosa will be in the driving seat to steer South Africa to a desired destination.